A man had two sons… There are three characters in today’s parable of the prodigal son, and so three acts, with each act centered around one of the three characters in the story. meek – young son, father! hungry and thirsty – young son, first for food, then for righteousness/justice! pure in heart – young son! A pure heart comes with struggle! We see in this parable the same reversal of righteousness that we see in the parable of the Pharisee and Tax Collector and in so much of Jesus’ teaching. Notice how chapter 15 of Luke begins: Now all the tax collectors and sinners were coming near to listen to him. 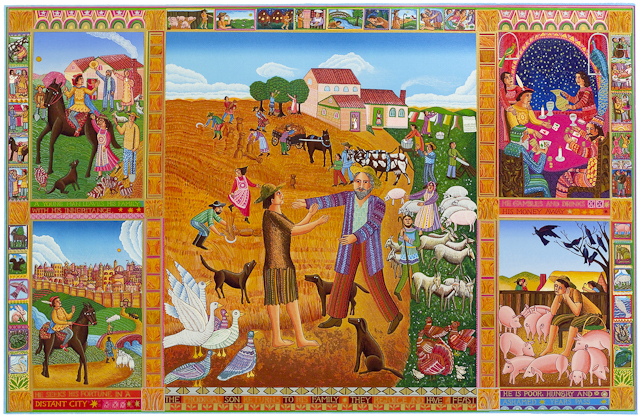 2 And the Pharisees and the scribes were grumbling and saying, “This fellow welcomes sinners and eats with them.” Jesus then tells three parables, all having to do with finding something that is lost: sheep, a coin, a son. The pharisees and scribes are operating from an attitude of shortage – there is not enough mercy and kindness to squander on undeserving people; it’s only for those who deserve it (deserving according to their definition, of course). Jesus operates from a different mindset, God’s mindset! There are no limits to God’s love, mercy and forgiveness. One of Warren Buffett’s most famous aphorisms is that rich people should give their children “enough to do anything but not enough to do nothing”. That’s good advice, and the father in the story could have used some advice from Buffett. But the point of the story is not really about money; money simply provides the motivation, the impetus, for the lesson. Act 1: The young son came to himself; which means he had gone away from himself. He had left behind not only his father, but his own true self, everything that was good in his own heart and soul. So he had to come to himself first, and then to his father. His hunger prompted a spiritual awakening! But it was very much a spiritual awakening, an awareness of what he had done to himself and to his family’s reputation. Act 2 begins with the father looking for his son. The father is an image of God. He receives his son and hardly gives him a chance to speak his remorse, but gives instructions for him to be dressed with the finest robe, a ring, and shoes. The symbolism here is rich, and the great St. Augustine interprets it allegorically: the robe to be the robe of blessedness that Adam lost, the ring to be the pledge of the Holy Spirit, the shoes for the feet that will run to announce the gospel of peace! Kill the fatted calf and let’s party. The kingdom of God is always a party! And this chapter 15 is all about the kingdom. Whoever is found, is found for the kingdom! Act 3 centers around the older son. The young son has gone into the house, into the party. Now the father comes out to see the older son, who is very upset at the father’s generosity to his undeserving brother. But the father’s answer is the answer that rings down the ages for us too: “All that is mine is yours.” There is no shortage in God’s heart. All that is his is also ours; that’s how immeasurable is God’s generosity and God’s desire to share the fullness of divine life with us! We don’t know whether the older son accepted the father’s invitation to come in and join the party. I’m sure he did, as we all would do in his shoes. As indeed we all do! The Pharisees resented the openness of Jesus. But don’t think of the Pharisees in purely Judaic terms. The Pharisees in the Gospels are simply symbols of something bigger. There is a “pharisee” in ALL of us; it’s human nature to put limits on love, and decide who is “deserving” and who is “undeserving”. But God is not a man. 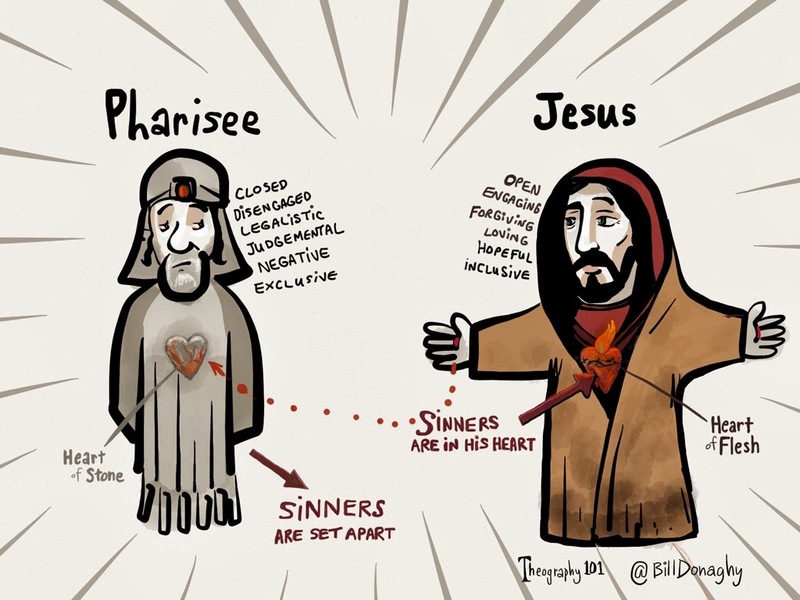 And Jesus was no pharisee. The older brother’s language reveals his conception of the father as authoritarian and controlling, common enough in Jesus’ culture but in no way fitting for this father, at least as he has been portrayed in the parable. And so also the younger son! How wrong both were. Many of us are wrong about God. We also see God as an authoritarian being, just looking to send us to hell. If God keeps watch over us it’s to lift us up, to forgive, to heal our souls and our relationships. To make us Beatitude people!! Categories: Sermons | Tags: Beatitude people, deserving and undeserving, fathers and sons, lost and found, Prodigal Son | Permalink. Finally Jesus turns to his own, Blessed are you…! It seems that Jesus addresses all humanity in the eight beatitudes: Blessed is anyone who is poor in spirit, meek, who mourns, who yearns for justice, who is merciful, pure in heart, peacemaker, and persecuted for the cause of justice. ANYONE! But then, Blessed are YOU when you are hated and persecuted for what…. For HIS sake, for Jesus’ sake. This is the unique persecution that only followers of Jesus will experience. 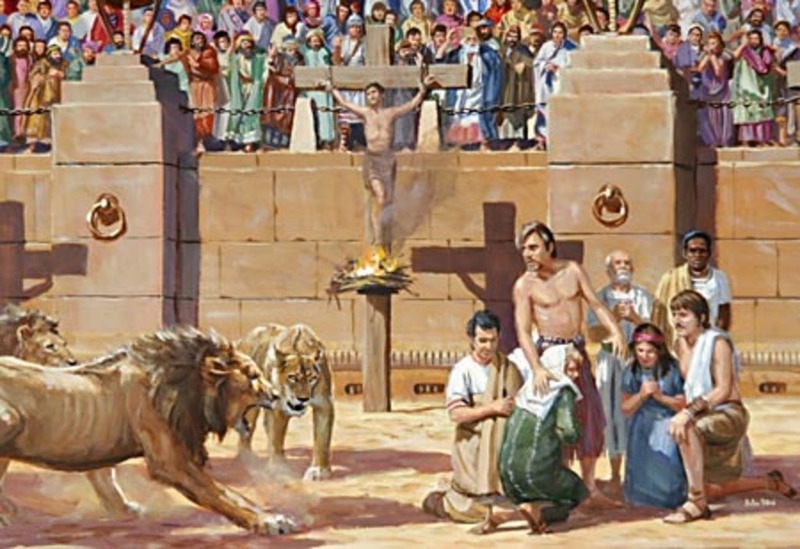 Anyone can be persecuted for justice, for working against injustice; not only Christians. But Christians will be persecuted and have been persecuted for their faith in Christ. And so what? Why are they blessed? Because “great is your reward in heaven.” Notice – and I have to make clear that this is my own interpretation, and I could be wrong or stretching things, but here goes: Blessed is anyone who is persecuted for justice and righteousness – theirs is the kingdom of heaven. The Christian also receives the kingdom of heaven – but the ‘reward’ is great if the Christian is persecuted for the sake of Christ. What is the great reward for those who are persecuted for the sake of Jesus? We’re not told. But Heaven is the great reversal of what happens here in our earthly lives. That’s why Jesus often said the first will be last and the last will be first. Heaven is the healing place. There is sickness in the world – hatred, selfishness, envy, bigotry, murder, economic and social injustice, suffering, political persecution, war, terrorism, too many walls and not enough bridges between human beings. Justice, righteousness, mercy, Jesus! These are the healing words – and they represent the kingdom of heaven. I’m not sure there is any significance to this arrangement, but it is clearly Matthew’s arrangement of Jesus’s words, and there is a certain poetic balance. And perhaps the healing sound of those verbs that are bookended by the kingdom of heaven is the real message of the Beatitudes. Healing is the message of Jesus throughout the gospels. Healing is his message to us – and the challenge to us. Healers are the poor in spirit, even when they are persecuted. And they are meek, and they mourn, and they hunger and thirst for righteousness and justice, and they are merciful, and pure in heart and peacemakers. Healing healers – followers of and inspired by the Great Healer himself. This is the message that is most urgently needed today. Christianity is more relevant, more needed today than it has ever been in history. Are we up to the challenge? Are we a people of the Beatitudes? Categories: Global Visions, Radical Christian Thoughts, Sermons | Tags: kingdom of heaven, martyrdom, persecuted for faith in Jesus, persecution for justice | Permalink. We attained the highest summits of the Beatitudes with the merciful and the pure of heart. But what do you do when you’re at the heights of Christian faith, spirituality and commitment to Jesus? You become what he was; you become a peacemaker. 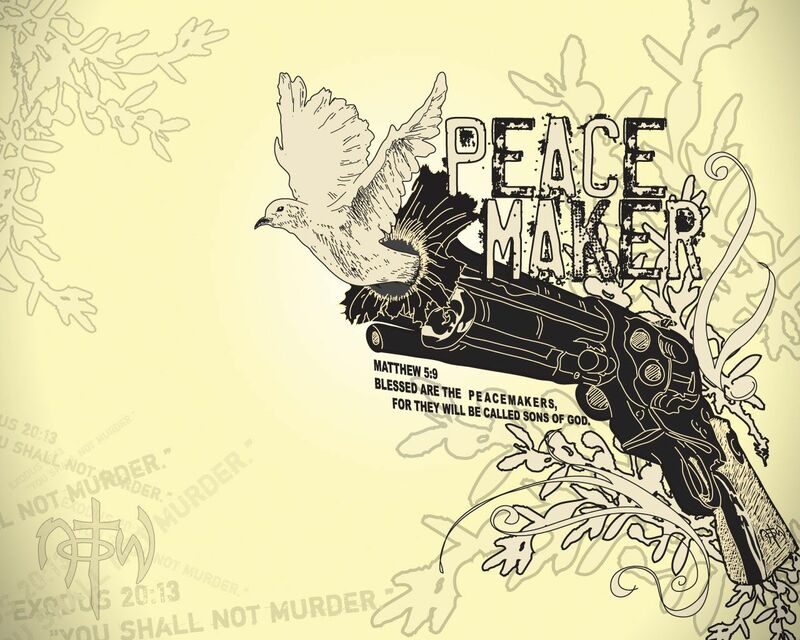 Blessed are the peacemakers, indeed – and they shall be called sons of God, [and daughters implied, of course]. Jesus is the son of God – the peacemakers are sons [and daughters] of God. Ephesians 2 For he is our peace… he… has broken down the dividing wall, that is, the hostility between us… that he might create in himself one new humanity in place of the two, thus making peace, and might reconcile both groups to God in one body through the cross, thus putting to death that hostility through it. So he came and proclaimed peace to you who were far off and peace to those who were near; for through him both of us have access in one Spirit to the Father. 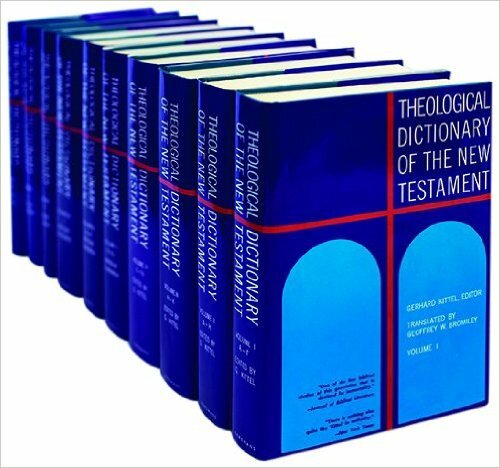 According to the Theological Dictionary of the New Testament, the basic feature of the ancient Greek concept of εἰρήνη is that the word does not primarily denote a relationship between several people, or an attitude, but a state, i.e., “time of peace” or “state of peace,” originally conceived of purely as an interlude in the everlasting state of war. In the Hebrew Bible, shalom means “well-being.” In meetings or letters well-being is wished to others, and in conversations one asks about their well-being…. More commonly שָׁלוֹם is referred to a group, e.g., a nation enjoying prosperity. This brings us closer to the thought of peace (TDNT). Rom 15:13 May the God of hope fill you with all joy and peace in believing, so that you may abound in hope by the power of the Holy Spirit. 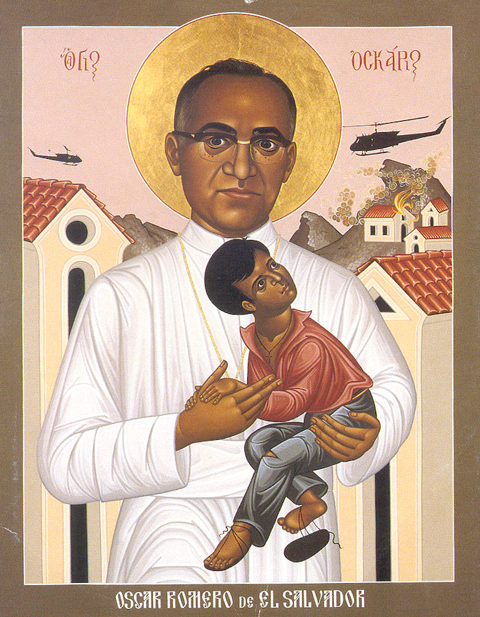 Oscar Romero, Roman Catholic Archbishop in El Salvador, paid with his life in 1980 for being a peacemaker. He is on the way to being proclaimed a Saint by Pope Francis. Colossians 1:19-20 For in him all the fullness of God was pleased to dwell, and through him God was pleased to reconcile to himself all things, whether on earth or in heaven, by making peace through the blood of his cross. ὅτι ἐν αὐτῷ εὐδόκησεν πᾶν τὸ πλήρωμα κατοικῆσαι καὶ διʼ αὐτοῦ ἀποκαταλλάξαι τὰ πάντα εἰς αὐτόν, εἰρηνοποιήσας διὰ τοῦ αἵματος τοῦ σταυροῦ αὐτοῦ, εἴτε τὰ ἐπὶ τῆς γῆς εἴτε τὰ ἐν τοῖς οὐρανοῖς. St. Gregory of Nyssa says that a peacemaker gives peace to another – but you cannot give to another what you do not possess yourself! Hence the Lord wants you first to be filled with the blessings of peace, so that you can then communicate it to others who need it. He then goes on to describe in graphic detail the physical appearance of people who are filled with hatred and envy – the opposite of peacemakers. 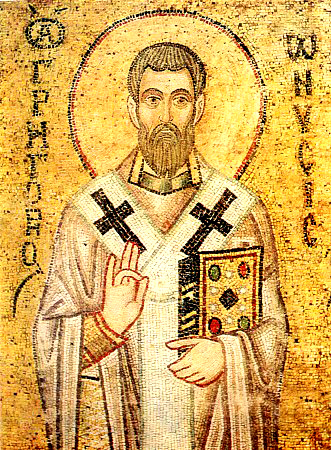 St. Gregory of Nyssa (335-394 AD), whose commentary on the Beatitudes is providing many insights. The peacemaker banishes these evil aspects of human nature and brings people together to share in what is good. This is why the peacemaker is called a child of God, because he/she imitates the Lord who is the Giver of all good things. God ordains for us also to throw off hatred and war, envy and strife, hypocrisy and any resentment that burns in the heart. Replace these evil things with the fruits of the Spirit – charity, joy, peace and so on. The peacemaker achieves inner harmony and unity of soul and flesh. The peacemaker is free of inner conflict. Only a person who knows peace in his/her inner life can be a peacemaker. Perhaps Gregory is a little too demanding here. A more realistic approach is to take Jesus at his word. Be a peacemaker and the inner peace and harmony will come in your life too, as the gift of the Holy Spirit. The attainment of inner peace and harmony goes hand in hand with being a peacemaker. Categories: Sermons | Tags: Beatitudes, peace, shalom | Permalink. The anticipation has been building the last few days that a big announcement would be made today, and sure enough it came this morning. Gravitational waves have been detected for the first time, the result of two black holes colliding and merging a billion years ago. Einstein predicted their existence a hundred years ago when he published his General Theory of Relativity (1915), and now we know they exist. 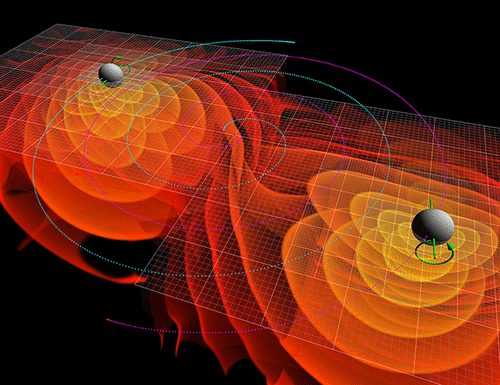 Numerical simulations of the gravitational waves emitted by the inspiral and merger of two black holes. From Physics (Feb 11, 2016). BBC News (maybe best coverage of all). The detection of gravitational waves allows us to witness the effects of the biggest ‘monsters’ in the universe, black holes. And indeed, the gravitational waves announced today were the result of the collision of two black holes a billion years ago! Future experiments, described in some of the coverage above, will allow us to peer into the first trillionth of a second of the Big Bang itself! I hope I live long enough to witness some of these exciting developments. Many things in science can be observed directly or reproduced in a laboratory. But the most extreme phenomena in science can only be observed indirectly. By extreme I mean the most minute, as in the realm of fundamental particles; and the most remote in the big scale of the universe. Gravitational waves are almost unique, because they are extreme in both senses: they relate to the biggest events in the cosmic scale of the universe, and yet they, like particles, can only be detected by their minute influence on the most sensitive measurements possible! I find the whole thing simply astonishing. This is a red-letter day for science – physics and cosmology specifically. Why am I so excited about this? First, because I do care about science. I worked in science for several years before switching to theology, which is a science of a different sort than what I was pursuing previously. But more important, I see in today’s announcement a methodology that is not very different from the way theology works. The Big Bang happened 14 billion years ago, so we can never observe it directly, no matter how far into the cosmos our telescopes take us (and remember, the farthest out into space we look the furthest back in time we are actually seeing, since what we see depends on how long light takes to reach us). But we can see the results of the Big Bang in the expansion of the universe and in something called the Microwave Background which permeates the entire universe and is the fingerprint of that initial explosion. So also gravitational waves: they are the fingerprint of the most violent events and objects in the universe, black holes especially. 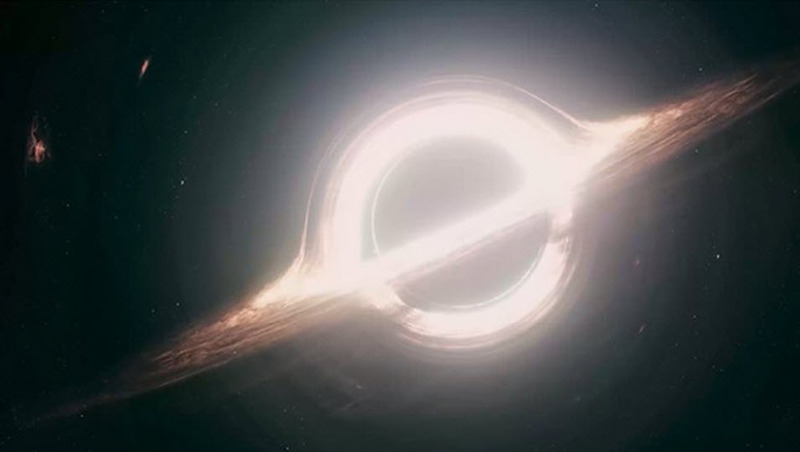 And of course, we probably will never directly see a black hole – contrary to science fiction movies like Interstellar (2014), which had a fascinating, but highly speculative, story line involving a black hole. But we can see the effects of black holes on space-time and gravitational waves. In an analogous way, we cannot see God, but we can see evidence of God and of God’s actions. In last Sunday’s sermon on the Sixth Beatitude, “Blessed are the pure in heart”, I referred briefly to the distinction that St. Gregory of Nyssa and Orthodox theology as a whole make between the ‘essence’ and ‘energies’ of God. We cannot see God in his inner core of his being, in his absolute essence; but we can see the energies of God, meaning God’s activities and the results of God’s existence. Quite frankly, one could almost say without exaggeration that the empirical evidence for God’s existence is stronger than the empirical evidence scientists have for black holes and the Higgs boson and other important pieces of the cosmic puzzle that is continuously falling into place. I don’t doubt for one minute the existence of black holes or the Higgs boson, and I have no doubt that Darwin’s theory of evolution is the best explanation for the variety of life that we see on earth. But most of the important scientific theories and discoveries rely on highly specialized research facilities and sophisticated experiments that often take years to produce results – as was the case with gravitational waves and the Higgs boson. But the evidence for God is almost universal across the entire range of human civilization. One or two scientists can be wrong, but can billions of human beings across 100,000 years all be wrong? Scientists who deny the existence of God come up with sophisticated and sometimes profound explanations for why there is religion; and although their explanations are meant to destroy the validity of religion and the belief in God, they do contribute important sociological insights into the variety of human beliefs and actually end up reinforcing the validity of this universal aspect of human existence. So next time someone asks you whether you have any evidence for God, ask that person if he or she knows anything about gravitational waves. It might be a good conversation opener that might bring you and the other person into better mutual understanding. 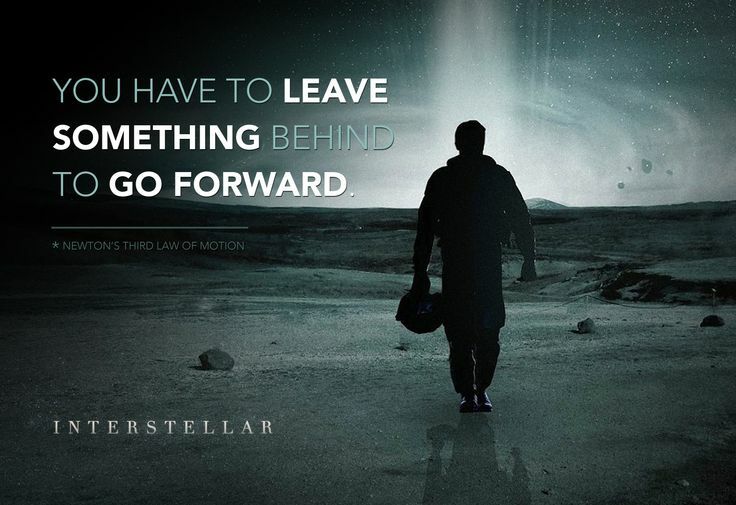 Something almost theological about this quote from the movie Interstellar. Categories: Global Visions, Radical Christian Thoughts, Theology | Tags: black holes, essence and energies, evidence for God, gravitational waves, theological methodology | Permalink. With this beatitude we are at the absolute summit. This is the holy of holies of the holy of holies! I looked at close to 50 translations. The majority say “pure in heart.” Jesus did not say “pure in thoughts” as some modern translations do. The Phillips translation says, “Happy are the utterly sincere, for they will see God!” Terrible! But καθαροὶ also means clean. So, Young’s Translation: “Happy the clean in heart — because they shall see God.” The Worldwide English New Testament says: “God makes happy those who have clean hearts. They will see God.” Not bad. Obviously Peterson puts in a lot of extra words there that are not in the original Greek – but he comes close to how St. Gregory of Nyssa interpreted this verse! Gregory got dizzy thinking about this verse and could not see how any human could actually see God! So Gregory resorts to the idea that we can not see God in his essence – in his inner, unapproachable being – but we can see/experience God through his energies. But he doesn’t stop there. Have you ever wondered about all these cooking shows that are so popular among TV viewers today? How many of these millions of viewers actually end up cooking? You’d never know from all the crowds at fast-food places! Gregory says something similar: It is not blessed to know something about God, but to have God present within you. That is why Jesus said, “The Kingdom of God is within you.” And then Gregory hits the jackpot: If a person’s heart has been purified of every unruly movement, that person will see the Image of the Divine Nature in his/her own beauty. Tremendous insight! Do you understand what Gregory of Nyssa is saying? If your heart is pure/clean, you will see God’s presence in your own beauty. Gregory is saying that you are beautiful. God has printed his own likeness, his own glory in you. God carved you and he is the model for what he carved in you! Is your heart not clean? Has the divine image been covered by all sorts of clutter? You can be clean, just like you can burnish a precious piece of silver so it shines again in all its brilliance. How do you become pure in heart? Gregory gives the only answer a Christian can give: through the whole teaching of the Gospel. The Gospel of Jesus Christ has everything you need to become pure in heart and thus to see God. My life is a distension (a Latin word meaning distraction and implying being scattered) in several directions. ‘Your right hand upheld me’ (Ps. 17:36; 62:9) in my Lord, the Son of man who is mediator between you the One and us the many, who live in a multiplicity of distractions by many things; so ‘I might apprehend him in whom also I am apprehended’ (Phil. 3:12– 14), and leaving behind the old days I might be gathered to follow the One, ‘forgetting the past’ and moving not towards those future things which are transitory but to ‘the things which are before’ me, not stretched out in distraction but extended in reach, not by being pulled apart but by concentration. So I ‘pursue the prize of the high calling’ where I ‘may hear the voice of praise’ and ‘contemplate your delight’ (Ps. 25:7; 26:4) which neither comes nor goes. But now ‘my years pass in groans’ (Ps. 30:11) and you, Lord, are my consolation. You are my eternal Father, but I am scattered in times whose order I do not understand. The storms of incoherent events tear to pieces my thoughts, the inmost entrails of my soul, until that day when, purified and molten by the fire of your love, I flow together to merge into you. I have highlighted the most pertinent parts: These are the words of a man whose life is scattered all over the place like your life and mine are also scattered all over the place. Perhaps nothing stands against purity of heart more than the clutter and distractions of our everyday lives. Augustine does not lose hope. 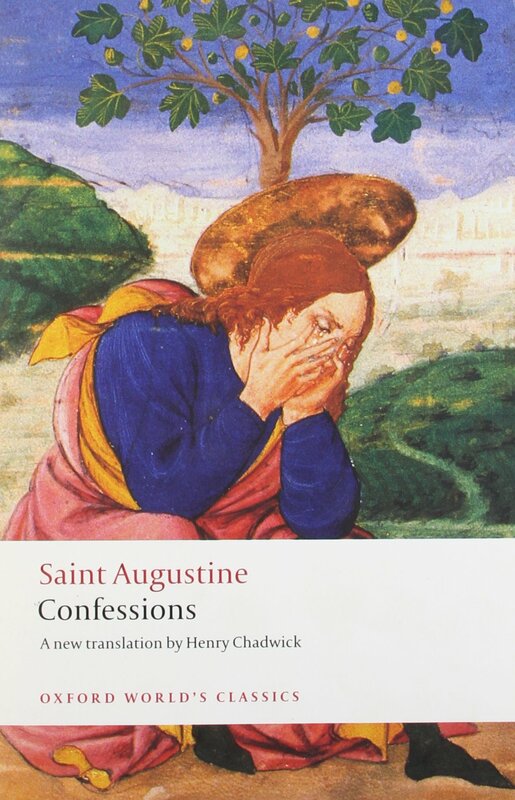 Though his soul is torn in so many directions until the day he dies, he looks to that day when all the clutter and dirt will be purified and melted by the fire of God’s love and he, Augustine, will become one with God. That’s the promise of the Sixth Beatitude. The promise is for you and for me. Never lose hope if you don’t see the beauty of God’s image in you. It will come. somehow, somewhen. Categories: Sermons | Tags: essence and energies, Gregory of Nyssa, Sixth Beatitude, St. Augustine's Confessions | Permalink.